Apple Corps. Perhaps no other record label is as legendary in rock history, and much of this is down to whose label it was. However, a huge part of it is also the chaos that ensued when the Beatles tried to establish a multimedia empire in the idealistic swirl of the late 1960s, only to run into very serious real-world business issues. Apple was also the pivot point in the band's eventual breakup and acrimony heading into the 1970s. One of the best books on this topic, which I have read several times and will be reviewing soon, is Peter Doggett's You Never Give Me Your Money. That book focuses on the entirety of the Apple Corps. saga, from its inception in 1967 to the present day. 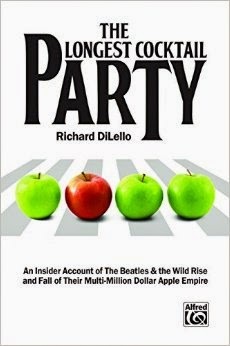 However, another book that has been well known to Beatles fans for a long time is Richard DiLello's The Longest Cocktail Party. First published in the early 1970s and finally back in print after many years, I've at last been able to read this book. Richard DiLello, or "The House Hippie" as he dubs himself in this book, was a young American from Queens, New York whose life was forever changed after he saw the Beatles for the first time on the Ed Sullivan show in February 1964. Making his way to California, he spent a few years in and around LA and San Francisco, crossing paths with former Beatles press officer Derek Taylor, who at that point was doing publicity for American artists and was instrumental in launching the career of The Byrds. Taylor was summoned back to London in 1967 when the Beatles launched Apple and he told DiLello to look him up if he was ever in London. In 1968, Richard spent some time in Europe before making his way to London and taking Derek up on his promise. Within weeks of arriving, he had a British work visa and was hired as Derek Taylor's right hand man at Apple. His book chronicles the years 1968 to 1970, when he worked at Apple and was involved in the Beatles' quest for a company that would be like no other, but which ended up collapsing due to the same problems every other company faces. The book is set up as a series of vignettes rather than traditional chapters, all of which are told in different ways: sometimes straight narrative, other times the author speaks in the third person and presents dialogue back and forth. Some chapters consist of press releases or newspaper articles, and others are random snippets of conversation overheard within the halls of 3 Saville Row. Humorous, enlightening, shocking, confusing...the book sets the reader up as a fly on the wall and gives an eyewitness account into the behind-the-scenes madness of Apple. Along with telling some crazy stories, DiLello does a nice job confirming or clarifying many events at Apple that have been touched upon elsewhere. For instance, the infamous 1968 company Christmas party that was ruined by the visiting Hell's Angels is described in great detail, as are other events such as the Mary Hopkin reception at the Post Office Tower, the arrival of Allen Klein on the scene, and the eventual dissolution of the Beatles. From inside Apple, it seems that the break-up of the band was more a gradual thing, while Klein slowly cleaned house and fired superfluous staff. Those that weren't fired stuck it out as long as they could bear until they finally quit. While the ridiculous excess and spending of company money by the staff and their hangers-on was absolutely ludicrous, Klein's measures to rein in in did seem, on the whole, a bit draconian. It's one thing to crack down on a mailroom clerk spending three hours and a small fortune on a fancy lunch and charging it back to the company, but it's another to require staff to fill out requisition forms just to get a sandwich from the cafeteria! The overall madness at Apple is painted in vivid picture by the author, from hippies and freaks who constantly hang around and do nothing (including a huge communal family who lived on the top floor for months! ), to certain staff members with sticky fingers who stole everything from typewriters and office supplies to the lead sheeting on the roof! Gradually, over time, it dawned on DiLello and others at Apple that things wouldn't and couldn't be the way the Beatles had initially intended, not if they wanted the business to be a success. Additionally, despite the Fab Four's good intentions to have a legitimate record company with a varied stable of artists, everyone knew that the Beatles' needs and interests came far before anyone else. This view was eventually picked up on by the artists who were signed to the label, many of whom grew dissatisfied with the lack of attention and promotion they were given and who left the label; the most notable case in this regard was James Taylor, who was discovered by Peter Asher at Apple and who recorded his first album for the label before leaving and going on to international stardom. The only band who stayed with Apple and achieved any modicum of success were Badfinger, discovered by Beatles road manager Mal Evans and given real hands-on attention by Paul McCartney. The Longest Cocktail Party is a true insider's account of the mad experiment that was Apple; it's a time capsule of a time gone by that was in equal parts more innocent, idealistic, and completely insane. Richard DiLello does a nice job of capturing all of the goings-on in a nontraditional but enjoyable and effective manner, pulling no punches in describing all of the drink, drugs, and crazy ideas that swirled around the building. The Beatles themselves feature very little in this book beyond when they are talked about or the times where they literally and figuratively pop their heads into the story for a moment. However, while this is a Beatles book, it's not really about the Beatles. It's about the Utopian fantasy world they tried to create as a tax shelter for their earnings, the business that would eventually drag them down and split them apart, and the young man who found himself right in the middle of it. I'm very thankful that The Longest Cocktail Party is back in print and available, and I think all serious Beatles fans will be, too.